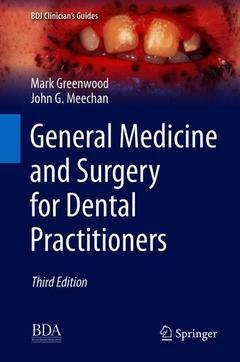 General Medicine and Surgery for Dental Practitioners Greenwood Mark, Meechan John G.
Authors: Greenwood Mark, Meechan John G.
Add to cart the livre of Greenwood Mark, Meechan John G.
History and Examination in the Clothed Patient in the Dental Surgery.- The Cardiovascular System and Dental Practice.- The Respiratory System and Dental Practice.- The Gastrointestinal System and Dental Practice.- Neurological Disorders and Dental Practice.- Liver Disease and Dental Practice.- The Endocrine System and Dental Practice.- Renal Disorders and Dental Practice.- The Musculoskeletal System and Dental Practice.- Haematology and Patients with Bleeding Problems and Dental Practice.- Metabolic Disorders and Dental Practice.- Skin Disorders and Dental Practice.- Psychiatry and Dental Practice.- Cancer, Radiotherapy and Chemotherapy and Dental Practice.- The Paediatric Patient and Dental Practice.- The Older Patient and Dental Practice.- Medical Emergencies in Dentistry.- Infections and Infection Control in Dental Practice.- Immunology and the Dental Practitioner. Mark Greenwood, BDS, MB ChB, MDS, PhD, FDSRCS, FRCS (England and Edinburgh), FRCS (OMFS), FHEA, is Consultant in Oral and Maxillofacial Surgery; Clinical Head of Oral and Maxillofacial Sciences and Honorary Clinical Professor of Medical Education in Dentistry at Newcastle upon Tyne NHS Hospitals Foundation Trust and Newcastle University, UK. From 2013 to 2015 he was Co-Clinical Director for the Dental Directorate in Newcastle. His main interests are the academic aspects of oral and maxillofacial surgery and the interface between medicine and dentistry. Prof. Greenwood has a special interest in undergraduate medical education in Dentistry, with a focus on teaching of core principles and development of clinical observational skills. He has authored a number of books including former editions of A Clinical Guide to General Medicine and Surgery for Dental Practitioners (BDJ Books). John Meechan was Senior Lecturer, Clinical Teaching Lead and Honorary Consultant in Oral Surgery at Newcastle University and the Newcastle Hospitals NHS Foundation Trust. He was the training programme director for Oral Surgery in Newcastle and chaired the Intercollegiate Surgical Fellowship Examination Board for Oral Surgery in the U.K. He is the recipient of a Distinguished Scientist Award from the International Association for Dental Research, a King James IV Professorship from the Royal College of Surgeons of Edinburgh, the Charles Tomes medal from the Royal College of Surgeons of England and has won the Medical Futures Innovations award for Dental and Oral Health.